Plantar fasciitis is the most common cause of heel pain, particularly in individuals 40-60 years of age. It is typically worst when taking the first few steps in the morning, after sitting for long periods of time, or after prolonged walking. Rest: try to modify or limit the activities that are causing your heel pain such as prolonged walking or athletic activities. Ice: Rolling your foot over a cold or frozen water bottle for about 15 minutes at a time can help decrease pain. Perform this 3-4 times a day. Exercise: Plantar fasciitis is commonly associated with tight calf muscles. There are two muscles in your calf, the gastrocnemius and the soleus, that can contribute to heel pain. Try performing these stretches and strengthening exercises at home to help decrease pain. If symptoms do not improve at home, be sure to contact your physician or physical therapist. Always check with your physician prior to beginning a new exercise routine to ensure it is safe for you. Vestibular disorders are characterized by various types of dizziness such as feeling lightheaded, spinning, floating, tilting, whirling, and feelings of unsteadiness. These episodes of dizziness can last for seconds to hours and may be associated with changing positions, laying down, or can even occur while you are sitting still. Feelings of dizziness can be very worrisome and it is important to see your physician to investigate more serious causes of dizziness such as a brain or heart condition. However, many causes of dizziness are less serious and are associated with a mechanical problem with your inner ear. In these cases, a physical therapist at Harbor Physical Therapy can help diagnose these conditions and design an individualized program to help alleviate symptoms of dizziness. Patients with diagnoses such as vertigo, benign paroxysmal positional vertigo (BPPV), migraines, imbalance, dizziness, and many others may benefit from physical therapy to assist in decreasing feelings of dizziness and improve balance so individuals are able to return to their daily activities. 1. 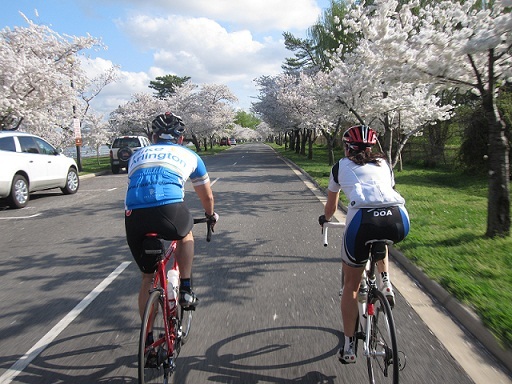 Cardiovascular Health – Biking will help to elevate your heart rate and provide a great aerobic workout. This will promote heart and lung health and can lower your blood pressure and risk for heart disease. 2. Low Impact Exercise – Compared to other forms of exercise such as running, biking has a very low impact on your joints, which is good if you are susceptible to having joint pain. 3. Good for all Fitness Levels and Ages – Even though it is low impact, that doesn’t mean it has to be easy! By adjusting speed, distance, and resistance, the exercise you get while biking can be as challenging as you want it to be. This makes it a good option for everyone, whether you are a high level athlete or are trying it for the first time. 4. Muscle Strength – Biking works the muscles in the legs as you are pushing the pedals, core muscles as you stay upright, and the muscles in your arms as you hold onto and steer the handlebars. Having more strength in these muscles can improve your ability to perform all of your daily activities such as standing, walking, and going up and down stairs. 5. It’s Fun! – Biking is a fun way to get around and explore. For safety, make sure you wear a helmet to protect your head. If you have any health issues and are unsure if biking is appropriate for you, check with your physical therapist or doctor first. Keep rooms in your home free of clutter to prevent tripping. Walk in shoes that have a good grip. Avoid wearing socks to decrease your risk of slipping. Keep your home well-lit to avoid tripping on objects that are hard to see. Make sure that all rugs in the home, as well as the bathtub and shower floor are nonslip. Stay active to improve strength, balance, and flexibility. If you have a history of falls, are fearful of falling, or feel that you have problems with walking, balance, or decreased strength, a visit to a physical therapist can help to address these issues and prevent any falls in your future. Winter weather is upon us! Even though temperatures are dropping, there are many options to continue exercising safely. If you spent the warmer months exercising outdoors, but continued making monthly membership ‘donations’ to your local fitness center, use this winter to redeem your money’s worth of classes and workouts! Gyms offer plenty of indoor cardio, conditioning, and strengthening exercise options. Most gyms also offer fitness classes if you like the group setting. If a gym membership is not your thing, there are also many exercise options online, TV on Demand, or on DVD. If you still plan to battle the elements and exercise outdoors through the winter months, be sure to make use of warm, protective clothing. Proper footwear, warm socks, hats, gloves, and layers are all important! Also, remember winter brings shorter hours of daylight so use reflective gear whenever necessary! Always remember safety first and consider alternatives to outdoor exercise when icy or extra cold outside! Cervicogenic Headaches stem from structures inside the neck and can radiate to the neck, back, front of the shoulders, scapula, down the arm, and chest. 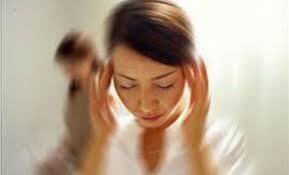 Migraine headaches are a disorder of the central nervous system involving nerves and blood vessels. Migraine headaches are throbbing recurring headaches that are typically found on one side of your head. These patients may report an increase in headache frequency and intensity, decreased ability to turn their head, increased pain with prolonged sitting postures, neck pain, muscle tightness and tenderness, arm and shoulder pain, weakness, dizziness, nausea and light headedness. Joint stiffness in the neck, muscle and tissue tightness, multiple trigger points, or nerve irritation may lead to cervicogenic headaches. Physical Therapy provides soft tissue massage, trigger point release, dry needling, stretching, modalities, joint mobilizations, strengthening postural muscles, and addressing proper body mechanics to decrease headache intensity and frequency. Migraines can have an aura or no aura. An aura is a visual disturbance that informs you of a migraine onset. Common auras are losing vision, seeing zig zags, light sensitivity, or flashing light colors. A migraine headache causes increased pain and throbbing on one side of your head. There are many causes to migraine headaches. Some examples are loud noises, bright lights, food, weather changes, lack of sleep, menstruation, and smoking. Determining the trigger for your migraine headache and working towards preventing it from happening. Physical Therapy provides modalities, massage, stretching, and traction to help diminish symptoms and decrease frequency and severity. Physical Therapy will teach you how to perform self massage and self traction to help diminish your symptoms. In severe cases where migraines are daily or several times a week, medication is prescribed. As the hot summer months approach, it is important to be aware of hot weather safety while staying active outdoors. Listed below are some precautions you should take before exercising outdoors this summer. Stay Hydrated – The increased summer temperatures will lead to increased fluid loss through sweating. 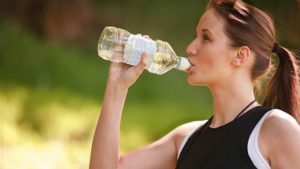 It is important to drink water throughout the day and increase fluid intake when exercising to replenish the body’s supply. Dress Appropriately – Wear light-weight, light colored clothing to reflect heat and aide in the evaporation of sweat. Avoid dark-colored clothing that absorbs light and heat. Take Your Time – Initially, decrease the intensity of your workout to avoid overexertion. As your body adjusts to the heat with more frequent workouts, gradually increase the length and intensity of your exercise routine. Watch the Temperature and Time of Day – Exercise in the morning or evening, when the temperature is cooler. If there is a heat advisory or the temperature feels too hot to exercise comfortably, consider taking your workout routine indoors. Know Your Medical History – Certain medical conditions or medications may place you at an increased risk for an adverse event when too much stress is placed on the body. Consult with your health care providers to ensure that you are performing the appropriate types of exercises under the right conditions. Listen to Your Body – If any of the following symptoms occur while out in the heat, it is important to seek immediate medical attention: confusion, irritability, dizziness, headache, nausea, vomiting, visual impairment, headaches, or muscle cramping. Certain sleep positions can cause more stress and strain on your muscles, joints and ligaments than others. 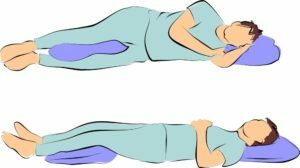 Lying on your back with a bent knee position supported by pillows. Lying on your side with your arms folded resting in front of your body and a pillow between your knees. 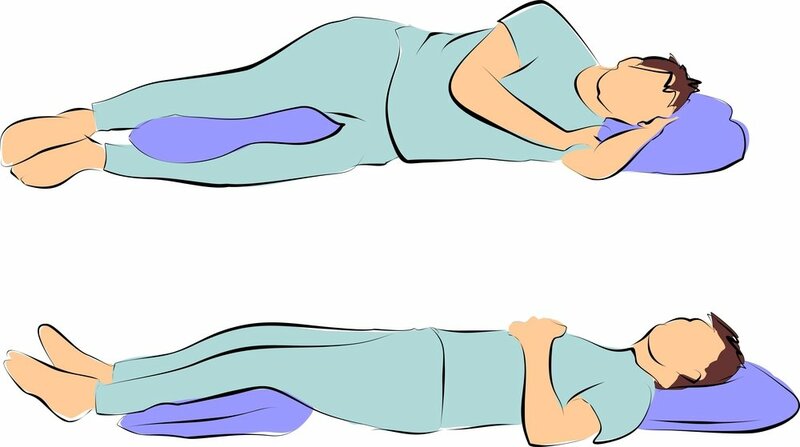 Lying on your stomach this causes increase neck strain and increase back strain due to the pillows under your head. Typically one pillow is best. When lying on a pillow, you want your spine to be level. You can gauge this by looking at your head position in comparison to your body. You want your neck to be in line with your body position at a zero degree angle. Where should I put my arms when I sleep? Ideally you want your arms in front of your body to avoid strain on your shoulder. Never have your arms above your head. This can compress the nerves that innervate your arm leading to numbness and or shoulder impingement. If you continue to wake up in the morning with pain, it is most likely due to your sleeping habits. Call Harbor Physical Therapy and make an appointment with one of our doctorate level physical therapists to learn how to decrease your pain by changing your sleeping position.